Autumn is just a wink away, and although the last thing you may want to think about is the weather getting cooler, I have some nail news that I hope you love as much as I do! It hits stores in September, which I can’t believe is next month! The summer has really flown by so quickly this year, hasn’t it? And there has been a lot of rain, which is odd. There are 4 shades, so it’s a small collection, but that’s okay. The colours look fun, and I think it’s a very unique collaboration to pair Charlie Brown with nail polish. It’s also cool to see fun black glitter polishes. Plus there isn’t a typical orange that you see a billion times in other Hallowe’en collections. Who Are You Calling Bossy?!? Look how cute the mini set is! Aww! The sunny yellow of Charlie Brown’s favorite t-shirt. Click here to see my OPI Good Grief! Swatches & Review! Linus awaits the Great Pumpkin in this orange and black glitter. This stormy black is no match for Lucy’s raven hair. Click here to see my OPI Who Are You Calling Bossy?!? Swatches & Review! 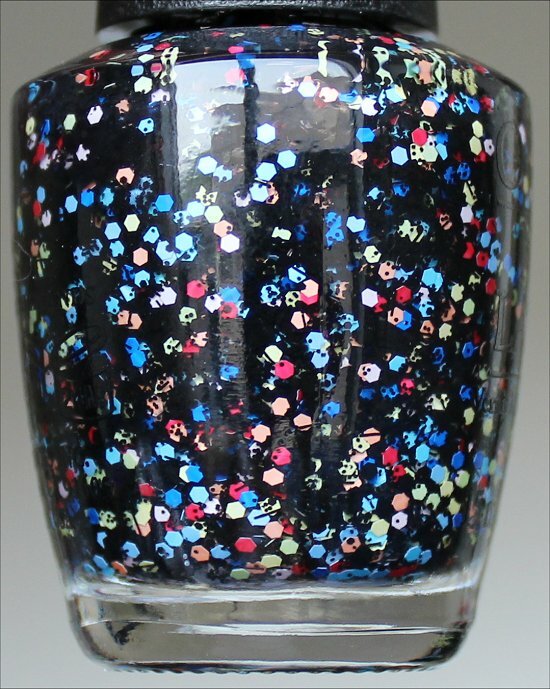 Snoopy’s happy-dance of colors in a joyful glitter. Click here to see my OPI To Be Or Not To Beagle Swatches & Review! Peanuts nail lacquer shades each feature OPI’s exclusive ProWide™ Brush for the ultimate in application. 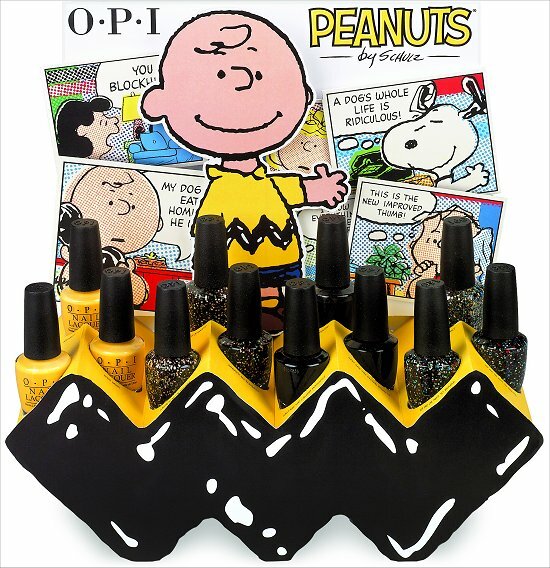 Peanuts by OPI and Little Peanuts mini pack will be available beginning September 2014 at Professional Salons and Spas. 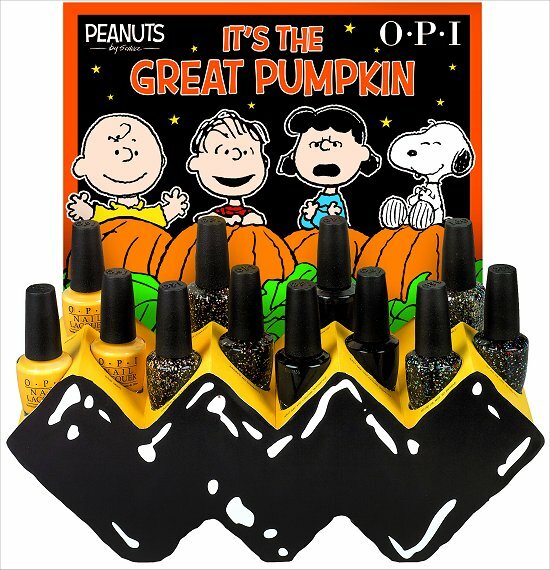 Peanuts nail lacquers will retail for $11.50 CAN each; Little Peanuts mini pack will retail for $17.50 CAN. Which is your favourite out of the four shades? How early do you start making Hallowe’en party plans? What do you normally wear on your nails for Hallowe’en, or does it change each year? 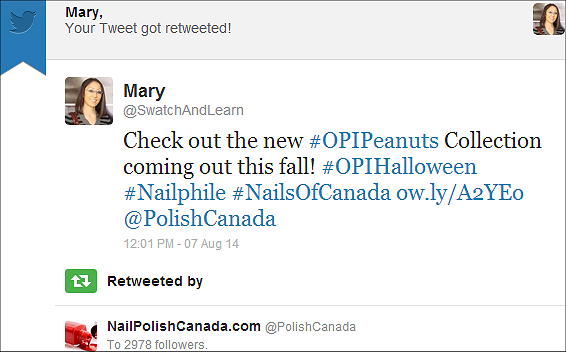 This entry was posted in Press Releases & Promo Pics and tagged OPI on August 7, 2014 by Mary S.. So cute!!! I love this! I love how they didn’t stick to just typical Hallowe’en colours for this collection! Hoh… seems like an interesting collection. 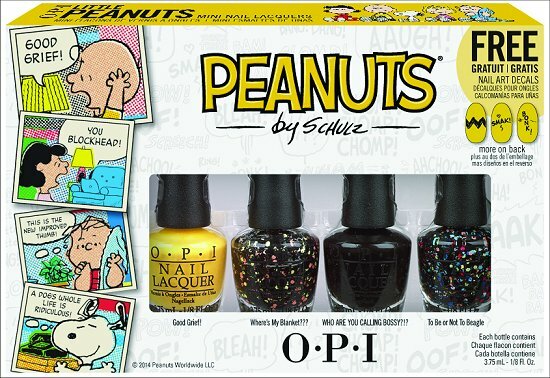 I am liking the idea of Peanuts collection but will have to wait for swatches to fully decide if I like it or don’t like it as much or if I feel its a let down. =/ Hmm, but if they are aiming for package sort of thing (if you get what I mean) I felt there is a need for some sort of white (off-white, grey tone-ish though) to be in there — to complete the whole comic-concept. Otherwise, if OPI were aiming for ‘just selling colours’, excuse me for ranting a bit here. But there are tons of yellow and black out there. I’m sure I can find a dupe with cheaper price-tags. I find it upsetting that they weren’t a little more creative with this collection. Sure yes, Charlie’s shirt is yellow but judging from the inspiration and the packaging on the box, a yellow with sparse small matte circle glitter (uniformed sized to mimic the dots) of orange/red colour might have been something a little more unique. And with the glitters bottles having black components in them already, a separate black creme feels… inappropriate. How about one inspired by their skin colour? Peachy-beige with sparse matte white small uniformed sized glitters. If not glittered, just a peachy-beige creme base makes more sense to me. It would’ve been awesome if they came out with a white that was a one-coater! I’m still waiting for them to come out with that. I understand how you feel about the black polish included. Guess they were obligated to include one for a Hallowe’en collection. The good thing is that the formula on it is lovely. I just scared my co-workers to death because I squealed like a 2 year old when I saw this post. OMG! I’m a DIE HARD Snoopy fan. I’m a fanatic for anything Snoopy so needless to say, I’ll be buying the entire collection ASAP! Hahahaha! I do that a lot, too. Maybe not at work, but it usually happens to me on the bus. I’ll be looking at something online, I’ll squeal, and people will look at me. 😛 Oops! It’s coming soon! 🙂 I can’t wait to wear that one, too! Aww, sorry to hear that the collection was a disappointment for you! The good news? At least you can save your money and put it toward another collection that you adore more! 🙂 There’s always a silver lining! You’ll have a lot of fun wearing different combinations with them, too! Even though it’s a small collection, they are pretty easy to incorporate into a manicure to give it an interesting pop of colour (especially with the glitters)!